What is it like to be on the front benches holding Justin Trudeau and his Liberals to account? 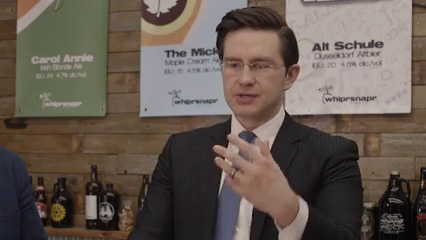 That is one of things we talk to Pierre Poilievre about in this second episode of Between Brian and Dave. Poilievre has been the finance critic for the Conservatives in the House of Commons since Andrew Scheer won the leadership. There is no question that Pierre has found his niche in calling out the likes of Bill Morneau during last summer’s small business attack. We also find out what this Westerner thinks of Montreal Smoked Meat, beer and what he does to relax. Between Brian and Dave is a subscription based show. Our crew doesn’t work for free and neither should they. It costs money to produce a quality show. We hope you consider supporting it. At just $4.99 a month, +H.S.T. or $49.99 for a year + H.S.T. this is not an expensive show. If you sign up for a yearly plan, you will get a 7 day trial. Next episode is talk radio legend Bill Carroll who has hosted some of the biggest shows in North America with spots in Toronto, Los Angeles and now calls Ottawa home. He’s even got some cool rock n roll stories. Look for that episode soon.